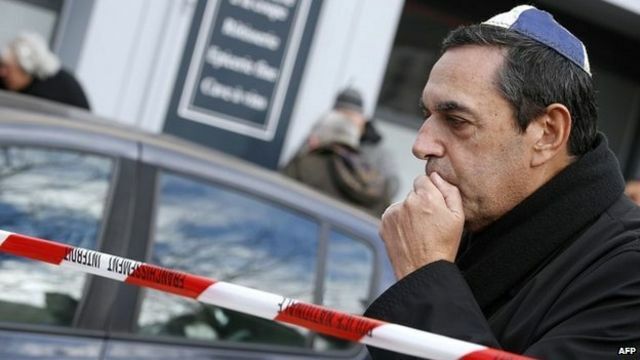 Jews 'don't feel safe in France' Jump to media player Paris is still in shock after four Jewish people were killed in an attack on a kosher supermarket on Friday and many Jews say they no longer feel safe in France. 'Uncertain times' for France's Jews Jump to media player As Newsnight's Kate Razzall reports, even before Friday's siege at a Paris kosher supermarket, there was a sense of fear among the country's Jews. Policeman's partner wants 'calm protests' Jump to media player The partner of a policeman shot dead by gunmen in Paris, has described the moment she heard about his death. Candlelit vigils held around Europe Jump to media player Vigils are held in cities around Europe, in memory of the 12 people who lost their lives in a gun attack at the offices of the satirical magazine Charlie Hebdo. Video shows gunmen fleeing attack Jump to media player Police say 12 people have been killed and 10 others injured in an attack by masked gunmen at the offices of the French satirical magazine Charlie Hebdo. How cartoonists reacted - 15 Secs Jump to media player Cartoonists around the world have published artwork in protest at the shooting dead of Charlie Hebdo magazine journalists in Paris on Wednesday. Footage of Kouachi siege ending Jump to media player Police footage shows French special forces at a warehouse in north-east Paris where two brothers who killed 12 in an attack on Charlie Hebdo magazine were shot dead. Charlie Hebdo editor remembered Jump to media player The partner of Stephane Charbonnier, the editor of Charlie Hebdo who was killed in Wednesday's attack in Paris, tells the BBC how she tried to reach him at the scene and pleaded to be with his body. Killed editor's partner blames France Jump to media player The partner of Stephane Charbonnier - the editor of Charlie Hebdo who was killed in Wednesday's attack - pays an emotional tribute to him. The Jewish community in Paris is still in shock after an attack on a kosher supermarket at Porte de Vincennes on Friday in which four Jews were killed. Many came to the scene of the attack on Saturday to lay flowers and pay tribute to the victims. The attack has left some French Jews considering moving to Israel and other countries because they do not feel safe in France.